Try smearing some of the red pepper dip on their frozen garlic naan, topping with caramelized onions, mozzarella, and goat cheese for an easy pizza. I also use it as a marinade for grilled chicken. I’ve also used that cake mix for a bananas foster-inspired upside down cake, with a quick rum caramel sauce and bananas sliced long ways. 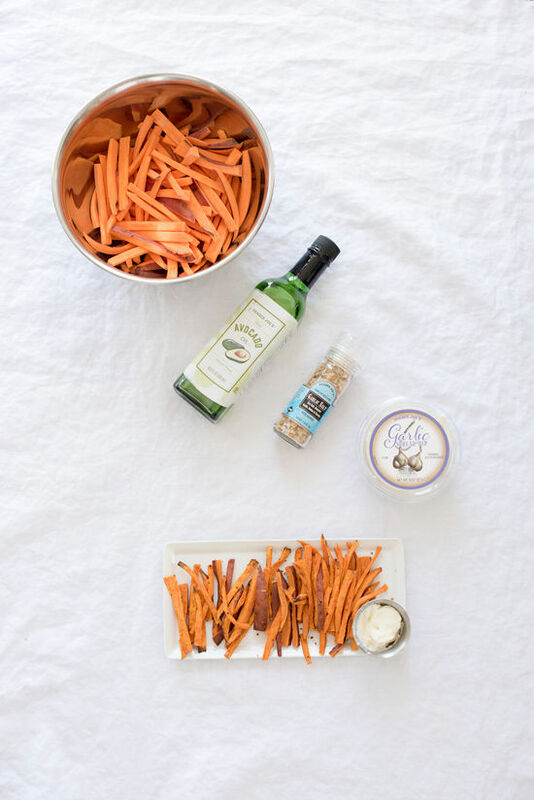 I’ve been so obsessed with making sweet potato fries at home lately. And that bruschetta crostini is so easy and sounds so good! The brioche bread makes an amazing grilled cheese with the sliced munster and colby jack cheeses! I have got to try that Avocado Oil! Love all these suggestions! 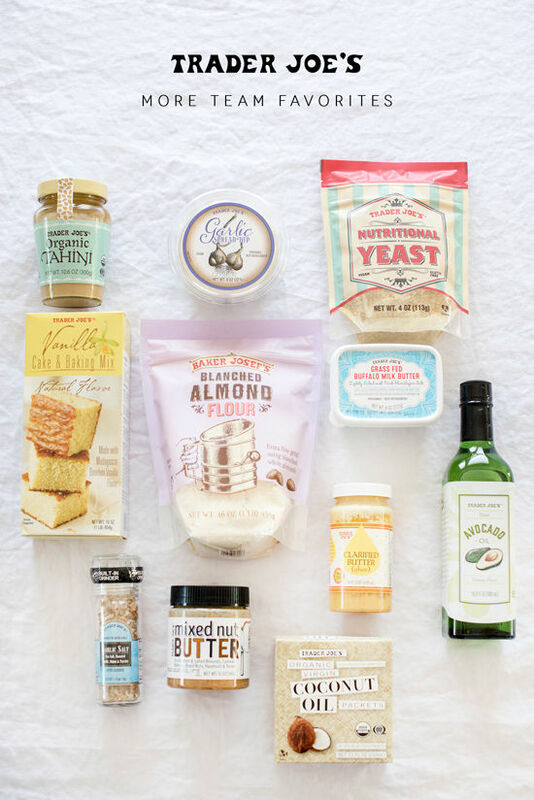 My husband works at Trader Joe’s, so I know all the secrets 😉 First off, everything is either locally sourced and/or ethically produced. They really do listen to customers so if you have recommendations of things you do/don’t like or would like to see, speak up. If you tried something and didn’t like it or you got something and it went bad (i.e. fruit/veg), you can take it back to the store and they’ll replace it for free. *Cheese puff things (kind of like crunch cheetos) – by snack section w/ chips: they come in a smaller bag than cheetos, but that also means less guilt whenever you finish them in a day, right? Anyway, we don’t go for those things every time. Most of the time, we go for all their fruits + veg, which is seasonal so it’s always pretty great! 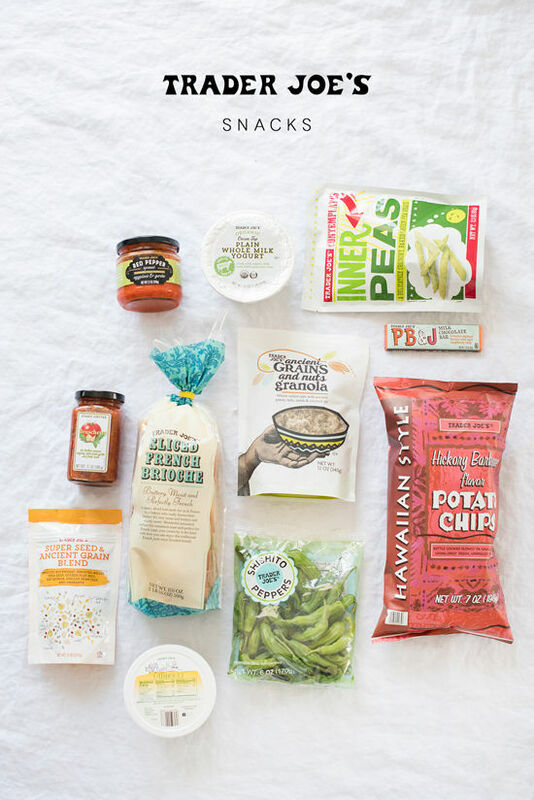 I need to go to Trader Joe’s now. I’ve been needing an almond flour for a while now. I need to try out Trader Joe’s brand. -Unsweetened vanilla almond milk in the refrigerated section…I swear it tastes better than any other brand I’ve tried. -Authentic greek feta in brine…the bomb! -Raw cashews & raw almond butter…I mean you honestly can’t get better prices anywhere else on those two items especially. -Balsamic glaze..drizzle over tomato, mozz and basil salad…yesssss. -Smoked salmon..again with the awesome price and selection. -Organic brown rice marshmallow treats…I feel like these are so underrated. If you like Rice Krispy Treats, then you’ll like these and they are a little better for you + 100 cal. Absolutely delicious! You girls are the best! Love your recipes and mix! Trader Joe’s is definitely at the top of my Things I Miss About the US list. I go nuts there when we come home to visit. – the pb stuffed pretzels! must try that butter, thanks for all the great recommendations! One of my long-time picks is the cheddar with carmelized onions. I love it! Also, for Indian food the frozen paneer tika masala can’t be beat, and for an indulgent breakfast, the wicked sticky buns. i just had that cheese for the first time, soooo good! *Kouigns Amann-a heavenly pastry that can be found in their freezer section near the chocolate and almond croissants. i like to use the tj’s garlic salt grinder because it has sea salt, roasted garlic, onion and parsley all in one. Really? onion and parsley all in one. Really? Thanks man this is beautiful and great info i like it so much good work brother! French fries with deep garlic are great snacks. I will make my children. ok let’s been thankful for all….